Working Grandmothers: Free Headband Ear Warmer Crochet Pattern with Sunflowers! What an honor it is to visit your blog today and see that sunflower in the spotlight! Thank you ever so much, Claudia! 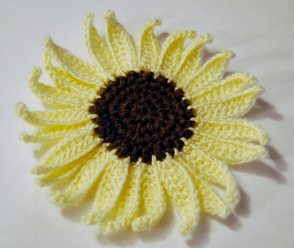 I hope we inspire the whole world to crochet sunflowers! Hi! I'm so happy you stopped by:-) This is a blog that I've had for a long time, I hadn't done much with in in recent months, but some ideas began to form, and I'm planning to keep working with it. Thanks for coming by and enjoying it.